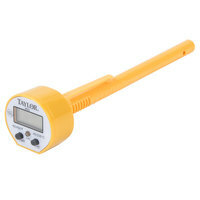 Get an accurate temperature every time with this Taylor 9842FDA 5" waterproof digital probe thermometer. Cooking foods at the right temperature for the right time is one of the primary pillars of food safety, and a thermometer is one of the easiest ways to ensure that you always hit that core temperature. This product delivers simplicity, durability, and speed to help you stay on top of food safety without dragging down productivity. 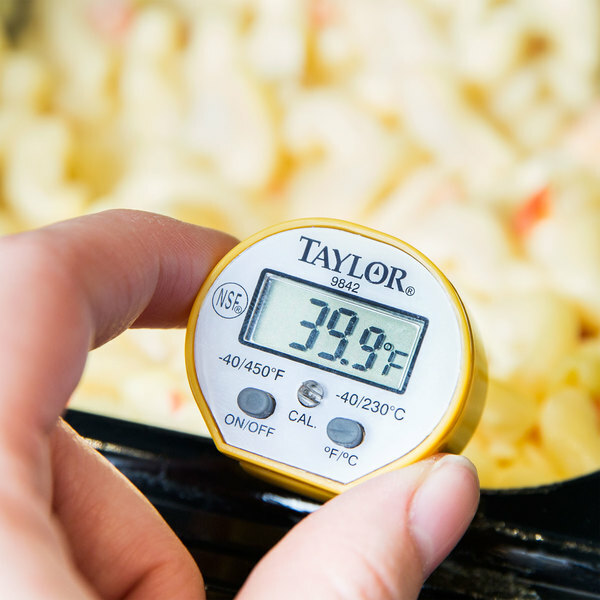 "The Taylor Probe Thermometer is great, fits easily into my kitchen jacket and apron and takes accurate readings of all foods, best part, it's waterproof." 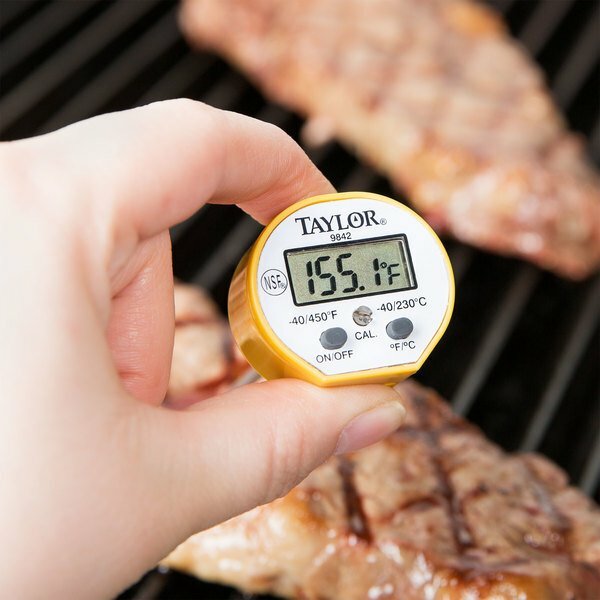 This thermometer's digital readout makes it easy to see the internal temperature within 5 seconds, and it can read temperatures between -40 and 450 degrees Fahrenheit. It comes with a battery, and has both an on / off button and an auto on/off feature to help you preserve your power for as long as possible. The durable stem allows for fast, easy cleaning and ensures that this thermometer will last you a long time. 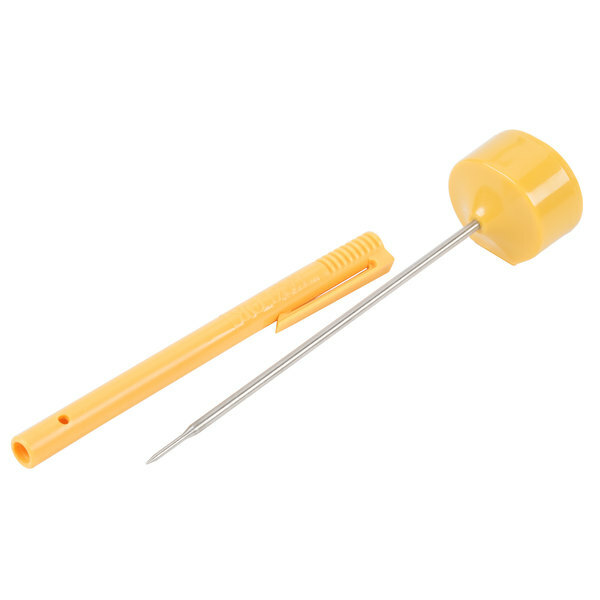 It measures 5" long so that you can penetrate deep into the product for an accurate reading. The plastic storage sleeve is made from anti-microbial plastic to keep your thermometer clean and ready to use. A built-in clip makes it easy to secure and take with you. 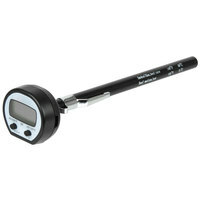 This thermometer is designed to be waterproof so that you never have to worry about dropping it into water or liquids. It will not ruin this product - just clean it off and you'll be back to reading temperatures in no time! The probe on this thermometer has a 1.5mm diameter, thinner than most non-FDA recommended probe thermometers. This, coupled with the sensing area in the tip, makes it great for getting the temperature on thin foods like hamburger patties and fish fillets. How do I safely and thoroughly clean my Taylor thermometer? Your Taylor thermometer is constructed of a durable stainless steel probe, and in some cases, a plastic head. When cleaning your thermometer, do not immerse it in water or use it in the dishwasher unless the description specifically states that it is waterproof and dishwasher safe. Simply clean the stainless steel stem with hot, soapy water and wipe the head with a damp cloth. Tablecraft B22 Employee Must Wash Hands Before Returning To Work Sign - Stainless Steel, 9" x 3"
Ordered 4 of these Taylor thermometers because of my past experiences with Taylor. Thermometers arrived earlier than expected. Had a bit of an issue calibrating 1 of them but eventually got. Have been extremely satisfied with these. My experiences with Webstaurant Store has always been satisfying. We use this probe to check out soft serve ice cream temperatures. Always gives us accurate results, which results in a great product. Easy to use as well. Definitely would recommend this product. I'm always a little shocked at how much digital thermometers can cost sometimes, but thus far I've found taylor to be the best for my buck. Great product! Easy to use and easy to read with the digital display. We have had a some issues with them falling out of the protective sleeve when in the sleeve pocket of a chef coat. 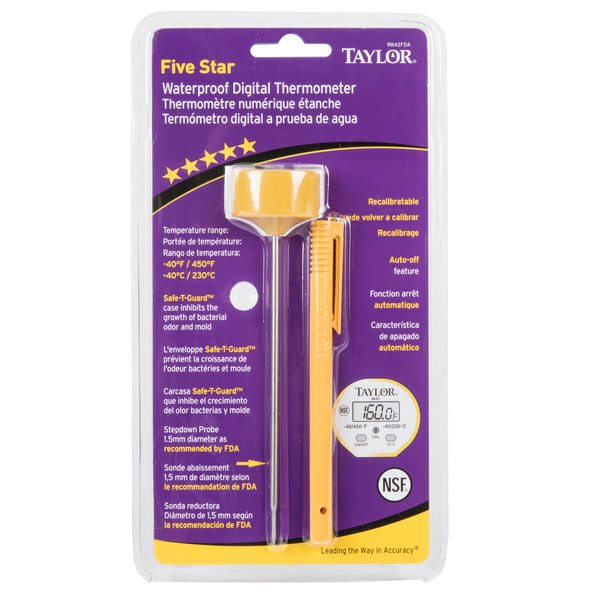 The Taylor 5" Waterproof Digital Pocket Probe Thermometer is highly accurate and durable. It is waterproof and easy to use. It is small enough to fit in your pocket. This is a must have for any commercial and residential kitchen. Unfortunately, these did not hold up. I thought it was one defective thermometer but both of them are giving us grief after just over one month of use. The temperature reading is way off and changes daily. We attempted to calibrate them but it doesn't stick. Our cold stuff is always "L" and our hot stuff is measuring way higher than it's supposed to. I'm searching for a more reliable digital thermometer now. This little digital has it all: Barely legible display, difficult to re-calibrate, short battery life, prone to moisture breach & oh yeah; try & replace the battery while you're on a mobile catering gig without the use of super colorful metaphors. Yep, no doubt about it, the 9842 is a technological marvel. I suggest that you store the ones that you have purchased in the same place that we did with the 3 that we own(ed)-the dumpster. Ending on a positive note though, the plastic color is cool. Thank you for your feedback, Robert! We are sorry you did not prefer this thermometer, if you are looking for recommendations please contact our Customer Solutions team! 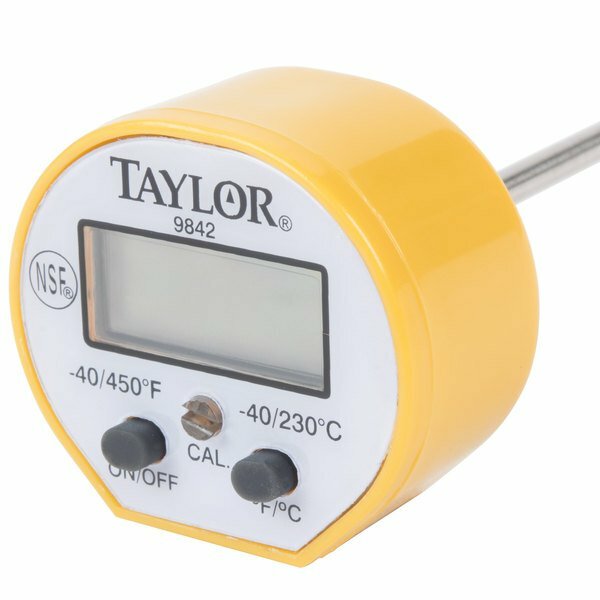 The Taylor Probe Thermometer is great, fits easily into my kitchen jacket and apron and takes accurate readings of all foods, best part, it's waterproof. To bad we can't give negative stars. DON"T BUY FROM WEBSTRAUNT Bought 6 of these thermometers. I opened one and it didn't work. read the instructions and it says to take out the battery and reinstall. It was difficult to get it back in. Still didn't work. Chatted online with April stating that the one I opened does not work and I want to return all 6. So I can return the unopened ones but I have to pay restocking and shipping. The defective one they will talk to the manufacturer about rather than just taking them all back and giving me my money back. Poor way to treat a customer. Thank you for the review, Merv. We are sorry you were not happy with our return policy. We were happy to help you receive credit for the broken thermometer. Please note that these thermometers are covered by a 1 year warranty by Taylor. If you find the remaining 5 thermometers to be defective, we will be more than willing to address this. This thermometer works great and is very durable. It is small and easy to store. The readings are accurate. I will be purchasing a few more. Waterproofing tested and confirmed. I accidenally dropped this into a pot of boiing water, it came out with the screen warped, but it functions perfectly. Works great and is highly durable. I have used this thermometer for 10 plus years, and in that time I only had to replace once this is truly an indispensable tool in any kitchen. small and handy. Check for accuracy before using for candy making. This reads a couple of degrees different than my larger ''candy thermomter'' but it is basically accurate. This is easier to store or carry, and less chance to damage with it's own shield. Good water proof option without spending a fortune. really like this thermometer. it can handle checking high heat and very cold temps. it stays accurate every time. great product for a great price. 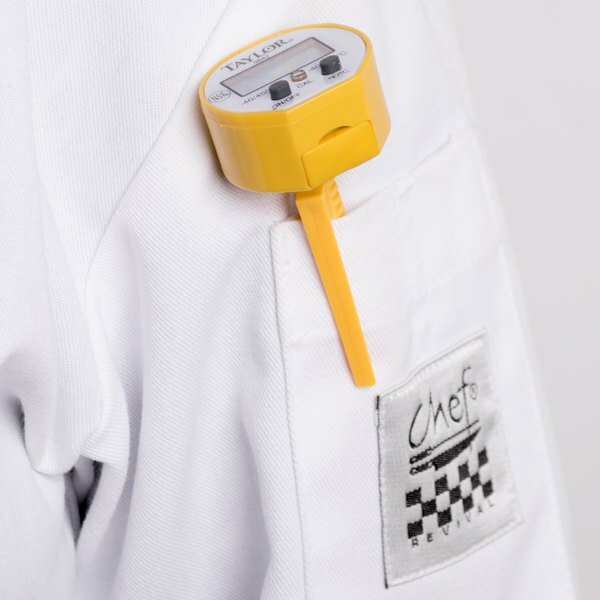 This thermometer fits nicely into a chef's coat sleeve pocket, it is simple, and functional, but it doesn't take a temperature read as quickly as others that I have used. These are very convenient to use. The instructor in my sanitation class recommended digital thermometers which he felt were much more accurate, so we switched to digital and have been very pleased with these. Low price, fast and low cost delivery,NSF approved products, shop from home at my own convience and open 24 hours a day, seven days a week !! You can't find better!!! We love this thermometer. It is perfect for quick checking of our sauces and fillings. The clip on the sleeve makes it easy to put on an apron pocket.